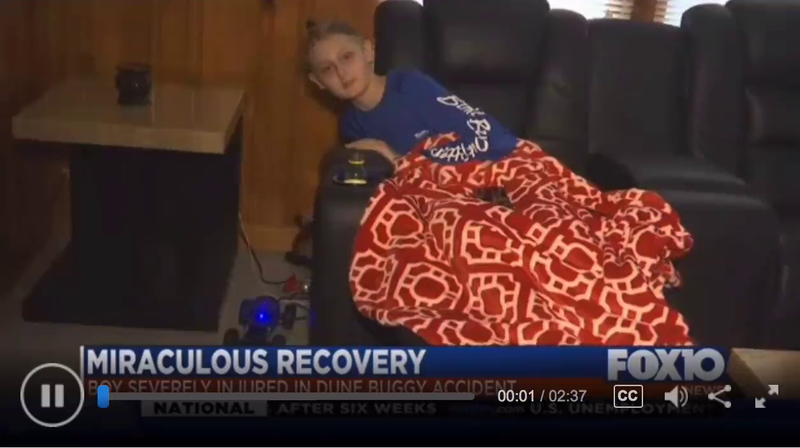 (by Devan Coffaro, FOX10 News) – An Alabama teen is being called a miracle boy after suffering severe brain trauma from a dune buggy accident. 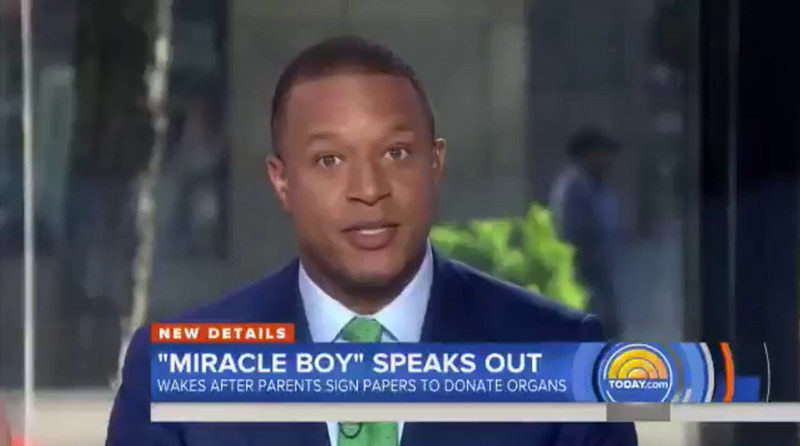 His family says he “came back to life” after they signed the paperwork to donate his organs. 13-year-old Trenton McKinley of Mobile was playing at a friend’s house two months ago. He was riding in a small utility trailer being pulled by a dune buggy for kids. Trenton says his friend pressed on the brakes suddenly, causing the trailer to flip. He says he quickly threw his friend’s 4-year-old niece off into the grass, but in the process, got caught in the trailer as it flipped. “I hit the concrete and the trailer landed on top of my head. After that, I don’t remember anything,” said Trenton. He was rushed to USA Medical Center for emergency surgery, and was later transferred to UAB Hospital in Birmingham. He had seven skull fractures. The family says for the next several days, Trenton was on life support and barely breathing. Reindl says she was approached by doctors to make a difficult decision. She and Trenton’s father signed the papers to donate his organs. A day before doctors were going to take him off life support, Trenton started showing small signs of cognition. He began breathing on his own and woke up speaking full sentences, his mother wrote on a Facebook fundraising page. Slowly but surely, Trenton is making strides beyond what anyone expected, but it’s not without a struggle. He’s lost 50 pounds, and deals with nerve pain and seizures daily. [He has had three brain surgeries and will have another procedure to reconnect the missing piece of his skull.] Despite all that, this kid’s still got a great sense of humor. Just talking to the young boy, you would never believe he has already been through three brain surgeries. He’s still got a long road ahead with a lot of medical expenses. Trenton currently only has half of his skull. The missing piece is frozen at the hospital. He will have surgery soon to reconnect it. Reprinted here for educational purposes only. May not be reproduced on other websites without permission from Fox10 News. 1. 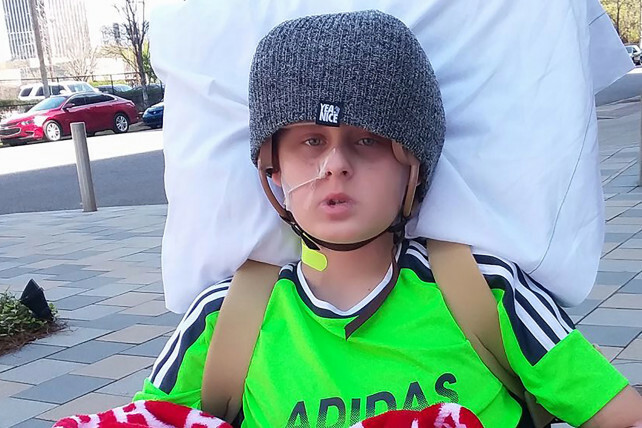 How did 13-year-old Trenton McKinley get injured? 2. What did doctors tell Trenton’s mother after he flatlined (had no brain waves or heartbeat) for 15 minutes? 3. What was Trenton’s condition for several days after the accident? 4. a) What did doctors ask/suggest to Trenton’s parents at that time? b) Why did his parents agree to take him off life support? 5. a) What happened the day before Trenton was set to be taken off of life support and his organs donated? b) To what / to whom does Trenton (and doctors) attribute his miraculous recovery? 6. How does this story inspire you?